Happy Monday, everybody! Are you excited? I’m excited. Yesterday my new site launched and I can’t wait to tell you about those changes. The updates I made were mostly to better organize the many verticals of content I now share on The Style Scribe. For those of you early readers, you’ll know when I first launched my blog five and a half years ago, it was 100% fashion-related. It stayed that way for about two years, and then after many requests from readers about my beauty routine, I sprinkled in some beauty content here and there. At that time I also started incorporating more and more travel content into my site. This year I’m pleased to say I have also added food & drink as well as video content! My previous site featured a very simple navigation menu, featuring a “BROWSE BY CATEGORY” button where you could select “Fashion”, “Beauty”, etc, but it was very difficult to locate specific posts – you would have had to scroll through weeks (or even months) of content to find the post you were looking for because everything was so vaguely categorized. With the new menu, you’ll find each category now has several sub-category options to choose from. For example, when you click on BEAUTY in my menu, the entire menu will expand to show you all of the ways you can explore my beauty content: Tutorials, Collages, Videos and Product Spotlights. You still have the option to view all beauty content, but with this new menu, you can be very deliberate and find exactly what you’re looking for with no hassle! Another change I’d like to point out is on the Travel page. You can get here by clicking on the TRAVEL button in the menu and then selecting “View All Travel Posts”. I created a landing page for my travel content so that you could pick and choose which locations you want to see with just a click of a button! Scroll down the page and you’ll find a map of the world. Every destination I have content for has a hot spot on that map! Hover over each hot spot to see what city it is, then click on it if you want to check out the content from that location! You can zoom in and out of the map, and move around, just by clicking on the map and dragging with your mouse. You may also choose a location by clicking the drop down menu to the bottom left of the map, entitled “Post Location”. Below the map on the Travel landing page you’ll find all of my most recent travel posts from all over the world. Whenever you see a city and the pin icon on a blog post, know that you can click on the city and be taken to a page featuring all of the content from that city! If you head back to the home page and click through to an outfit post – this one, for example, you’ll see some magic happen as you scroll down the page… As you scroll down through the photos towards the bottom of the page, you’ll find that the entire “Shop The Post” section scrolls with you! On the far left you’ll find text links to the products, and in the middle you’ll find product photos for everything featured – these photos are also linked, so click those if you prefer! Once you scroll to the bottom where the text content is, the “Shop The Post” section will stick and stay where my “Shop The Post” links usually are. So now you have two ways to shop my posts! Please note that if you are reading my blog from a phone or tablet, the “Shop The Post” scrolling bar may not appear due to the height of your screen. You’ll still be able to “Shop The Post” by scrolling to the bottom like you’re used to doing on The Style Scribe! I’m bringing back THE SHOP! For those of you who have been following along for awhile, I used to have a page dedicated to my favorite pieces that my readers could go to whenever and shop my latest must-haves. I would update this often, but because it was a static widget, it didn’t have the aesthetic touch I was looking for. I got rid of it, and haven’t had one for a couple of years now. With a new developer helping me out, he created a custom shop page so that I could get what I want from it and have it still look integrated into my site. So with that, I’m please to introduce the new and much improved SHOP to you! I’ve added categories that will be ongoing, like Style Staples, Best of Beauty, Under $100, My Most Wanted, and Haute Home. In addition to those categories, I’ll be adding and removing categories seasonally – for example, I’ll definitely have a Holiday Gift Guide category this winter, and more things like that. Regardless of the categories, I’ll be updating them weekly, so check back often for fresh new finds! Click here to check out THE SHOP! Finally, I decided to do a bit of rebranding and update my logo. I feel it more accurately reflects the clean, editorial look of my content, don’t you? I’ll also be unveiling a new design for my various collage posts like THE EDIT, AT ANY AGE, etc, so stay tuned for those! I hope you enjoy the new look and feel of The Style Scribe! As always, I welcome your feedback, so if there’s ever anything missing or you think I should include, email me! Yes I”m excited! What was marvelous before is even more so now with these updates. Can’t wait to fully explore! Great way to start the day today! I absolutely LOVE the new site, Merritt! It’s so crisp and definitely reflects your taste + style. The new site looks wonderful Merritt! I love it! So clean and crisp, seems like the perfect update! I love how the ‘shop this post’ scrolls with you – such a smart design idea. Congratulations on the new design. Congratulations on the site update. It looks GREAT! My only suggestion is to make your header “sticky”. Otherwise I have to scroll to the top each time. Love the new look! So clean and crisp! 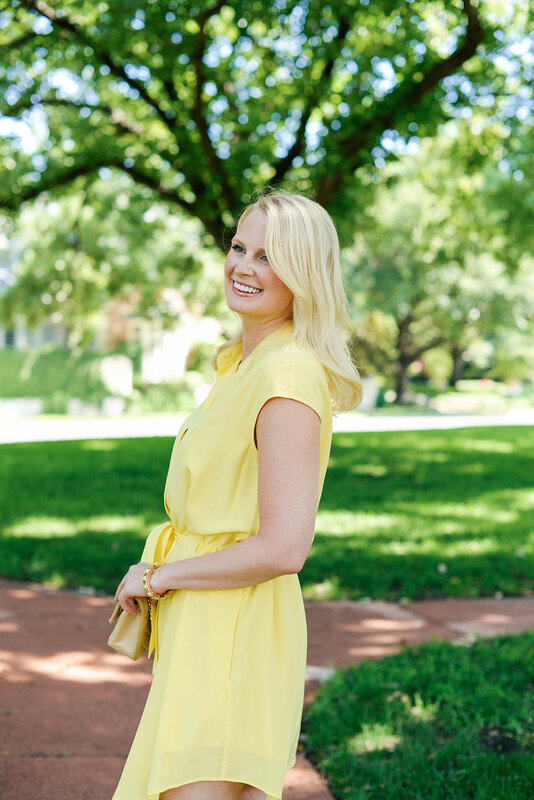 And that yellow shirtdress is so pretty! Such a great color for summer! Everything looks amazing! And you wear yellow so well. Love your amazing site update! Soooo good! And your look is just fab! Loving these updates!!! You have me noticing that I need to make some much needed organizational updates to my site too. P.S. that yellow dress is so lovely on you! Awesome, Merritt!! I especially love the map and the ability to click on the location tag of any post. Well done. It looks great, congrats! And I just love that dress, yellow is so pretty on you. Looks fantastic, Merritt!!! 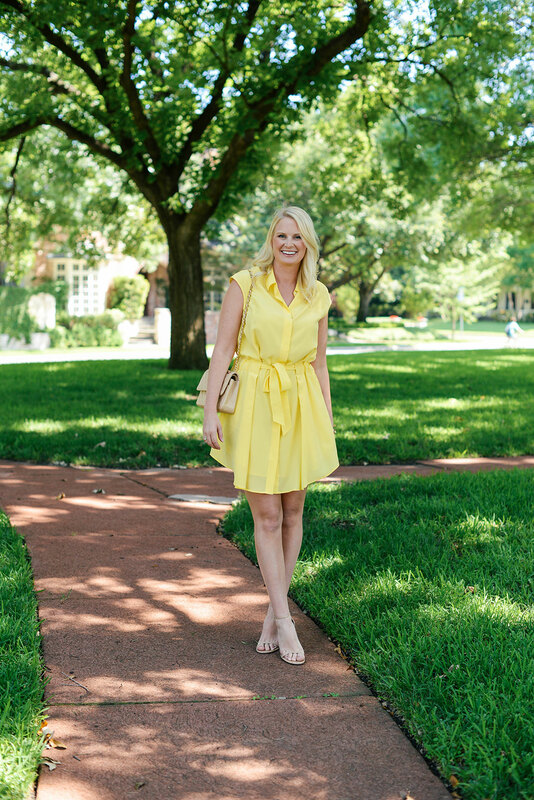 This yellow dress is adorable and so perfect for summer! Hi Dana! Thank you for letting me know! As with any new site update, there may be some glitches. We’re working on getting all those bugs fixed! If you happen to come across any others, please let me know! you look lovely in yellow and I adore the new site. Very pretty and clean. Looks great! I really like how the “Shop the Post” bar stays with you as you scroll. Congrats on the new site! 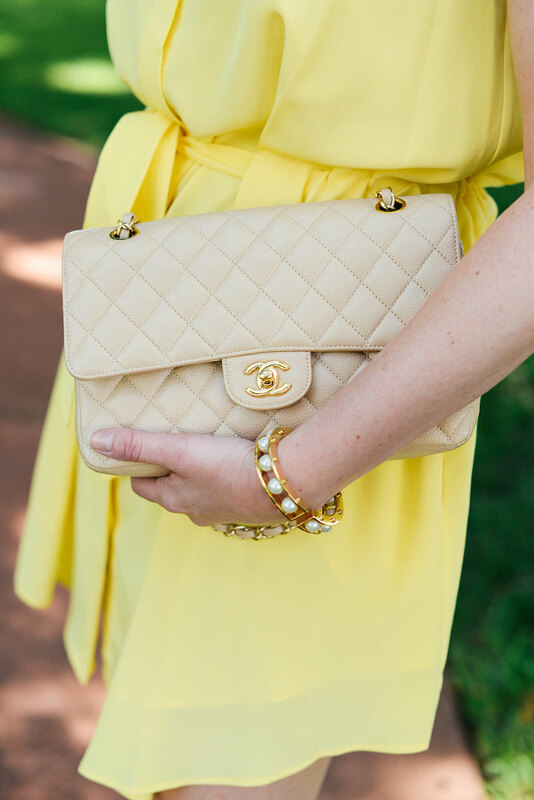 Love this dress on you too – yellow is beautiful with your blonde hair! I’m LOVING the new site!! Congrats!! Loving the new site!! And Stunning look, it’s perfect for Summer! Your site looks gorgeous! Such a clean, simple look which I absolutely love! And, you look fabulous in yellow! it looks great! LOVE the static bar at the bottom! Oh I will say would love your “next post” back! Love when sites that have a “read more” have that feature so it’s easy to see everything you’ve missed! Hi Merritt! Loved how you matched your outfit with your new web style! The colors looked amazing in the newsletter :) Yellow definitely suits you like crazy! Happy summer!